Greek history for the next forty years after Plataea and Mycale is a story of comparative peace and tranquillity. There were wars, but they were not intense wars. For a little while in Athens, for a section of the prosperous, there was leisure and opportunity. And by a combination of accidents and through the character of a small group of people, this leisure and opportunity produced the most memorable results. Much beautiful literature was produced; the plastic arts flourished, and the foundations of modern science, already laid by the earlier philosophers of the Ionian Greek cities, were consolidated. Then, after an interlude of fifty odd years, the long-smouldering hostility between Athens and Sparta broke out into a fierce and exhausting war, which sapped at last the vitality of this creative movement. This war is known in history as the Peloponnesian War; it went on for nearly thirty years, and wasted all the power of Greece. At first Athens was in the ascendant, then Sparta. Then arose Thebes, a city not fifty miles from Athens, to overshadow Sparta. Once more Athens flared into importance as the head of a confederation. It is a story of narrow rivalries and inexplicable hatreds that would have vanished long ago out of the memories of men, were it not that it is recorded and reflected in a great literature. Through all this time Persia appears and reappears as the ally first of this league and then of that. About the middle of the fourth century B.C., Greece becomes aware of a now influence in its affairs, that of Philip, King of Macedonia. Macedonia does, indeed, arise in the background of this incurably divided Greece, as the Medes and Persians arose behind the Chaldean Empire. A time comes when the Greek mind turns round, so to speak, from its disputes, and stares in one united dismay at the Macedonian. Planless and murderous squabbles are still planless and murderous squabbles even though Thucydides tells the story, even though the great beginnings of a new civilization are wrecked by their disorders; and in this general outline we can give no space at all to the particulars of these internecine feuds, to the fights and flights that sent first this Greek city and then that up to the sky in flames. Upon a one-foot globe Greece becomes a speck almost too small to recognize; and in a short history of mankind, all this century and more of dissension between the days of Salamis and Plataea and the rise of King Philip shrinks to a little, almost inaudible clash of disputation, to a more note upon the swift passing of opportunity for nations as for men. But what does not shrink into insignificance, because it has entered into the intellectual process of all subsequent nations, because it is inseparably a part of our mental foundation, is the literature that Greece produced during such patches and gleams of tranquillity and security as these times afforded her. «Their outer political history, indeed, like that of all other nations, is filled with war and diplomacy, with cruelty and deceit. It is the inner history, the history of thought and feeling and character, that is so grand. They had some difficulties to contend with which are now almost out of our path. They had practically no experience, but were doing everything for the first time; they were utterly weak in material resources, and their emotions, their ‘desires and fears and rages,’ were probably wilder and fiercer than ours. Yet they produced the Athens of Pericles and of Plato». This remarkable culmination of the long-gathering creative power of the Greek mind, which for three and twenty centuries has been to men of intelligence a guiding and inspiring beacon out of the past, flared up after the battles of Marathon and Salamis had made Athens free and fearless, and, without any great excesses of power, predominant in her world. It was the work of a quite small group of men. A number of her citizens lived for the better part of a generation under conditions which, in all ages, have disposed men to produce good and beautiful work; they were secure, they were free, and they had pride; and they were without that temptation of apparent and unchallenged power which disposes all of us to inflict wrongs upon our fellow men. When political life narrowed down again to the waste and crimes of a fratricidal war with Sparta, there was so broad and well-fed a flame of intellectual activity burning that it lasted through all the windy distresses of this war and beyond the brief lifetime of Alexander the Great, for a period altogether of more than a hundred years after the wars began. Flushed with victory and the sense of freedom, fairly won, the people of Athens did for a time rise towards nobility. Under the guidance of a great demagogue, Pericles, the chief official of the Athenian general assembly, and a politician statesman rather of the calibre of Gladstone or Lincoln in modem history, they were set to the task of rebuilding their city and expanding their commerce. For a time they were capable of following a generous leader generously, and Fate gave them a generous leader. In Pericles there was mingled in the strangest fashion political ability with a real living passion for deep and high and beautiful things. He kept in power for over thirty years. He was a man of extraordinary vigour and liberality of mind. He stamped these qualities upon his time. 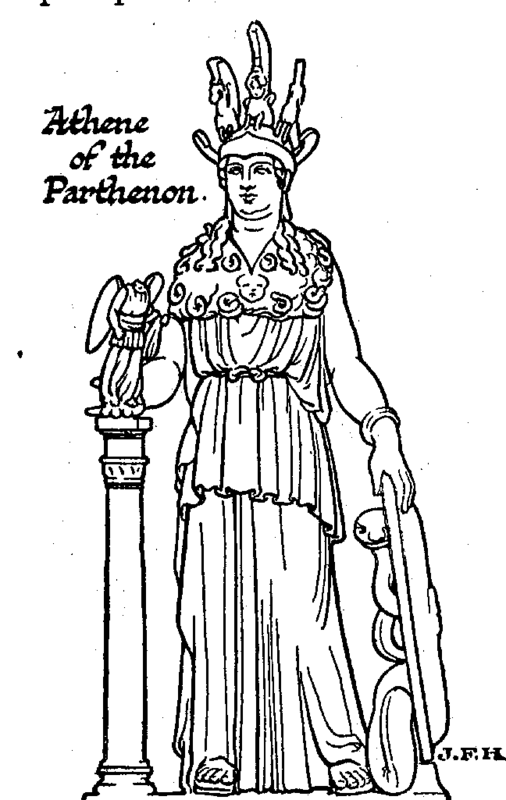 As Winckler has remarked, the Athenian democracy had for a. time «the face of Pericles». He was sustained by what was probably a very great and noble friendship. There was a woman of unusual education, Aspasia, from Miletus, whom he could not marry because of the law that restricted the citizenship of Athens to the home-born, but who was in effect his wife. She played a large part in gathering about him men of unusual gifts. All the great writers of the time knew her, and several have praised her wisdom. Plutarch, it is true, accuses her of instigating a troublesome and dangerous but finally successful war against Samos, but, as he himself shows later, this was necessitated by the naval hostility of the Samians, which threatened the overseas trade of Athens, upon which all the prosperity of the republic depended. Men’s ambitions are apt to reflect the standards of their intimates. Pericles was content, at any rate, to serve as a leader in Athens rather than to dominate as a tyrant. Alliances were formed under his guidance, new colonies and trading stations were established from Italy to the Black Sea; and the treasures of the league at Delos were brought to Athens. Convinced of his security from Persia, Pericles spent the war hoard of the allies upon the beautification of his city. This was an unrighteous thing to do by our modern standards, but it was not a base or greedy thing to do. Athens had accomplished the work of the Delian League, and is not the labourer worthy of his hire? This sequestration made a time of exceptional opportunity for architects and artists. The Parthenon of Athens, whose ruins are still a thing of beauty, was but the crown set upon the clustering glories of the Athens Pericles rebuilt. Such sculptures as those of Phidias, Myron, and Polyclitus that still survive, witness to the artistic quality of the time. The reader must bear in mind that illuminating remark of Winckler’s, which says that this renascent Athens bore for a time the face of Pericles. It was the peculiar genius of this man and of his atmosphere that let loose the genius of men about him, and attracted men of great intellectual vigour to Athens. Athens wore his face for a time as one wears a mask, and then became restless and desired to put him aside. There was very little that was great and generous about the common Athenian. We have told of the spirit of one sample voter for the ostracism of Aristides, and Lloyd (in his Age of Pericles) declares that the Athenians would not suffer the name of Miltiades to be mentioned in connection with the battle of Marathon. The sturdy self-respect of the common voters revolted presently against the beautiful buildings rising about them; against the favours shown to such sculptors as Phidias over popular worthies in the same line of business; against the donations made to a mere foreigner like Herodotus of Halicarnassus; against the insulting preference of Pericles for the company and conversation of a Milesian woman. The public life of Pericles was conspicuously orderly, and that presently set the man in the street thinking that his private life must be very corrupt. One gathers that Pericles was «superior» in his demeanour; he betrayed at times a contempt for the citizens he served. «Pericles acquired not only an elevation of sentiment, and a loftiness and purity of style far removed from the low expression of the vulgar, but likewise a gravity of countenance which relaxed not into laughter, a firm and even tone of voice, an easy deportment, and a decency of dress which no vehemence of speaking ever put into disorder. These things, and others of a like nature, excited admiration in all that saw him. Such was his conduct, when a vile and abandoned fellow loaded him a whole day with reproaches and abuse; he bore it with patience and silence, and continued in public for the despatch of some urgent affairs. In the evening he walked softly home, this impudent wretch following, and insulting him all the way with the most scurrilous language. And as it was dark when he came to his own door, he ordered one of his servants to take a torch and light the man home. The poet Ion, however, says he was proud and supercilious in conversation, and that there was a great deal of vanity and contempt of others mixed with his dignity of manner… . He appeared not in the streets except when he went to the forum or the senate house. He declined the invitations of his friends, and all social entertainments and recreations; insomuch that in the whole time of his administration, which was a considerable length, he never went to sup with any of his friends but once, which was at the marriage of his nephew Euryptolemus, and he stayed there only until the ceremony of libation was ended. He considered that the freedom of entertainments takes away all distinction of office, and. that dignity is but little consistent with familiarity… ». There was as yet no gutter journalism to tell the world of the vileness of the conspicuous and successful; but the common man, a little out of conceit with himself, found much consolation in the art of comedy, which flourished exceedingly. The writers of comedy satisfied that almost universal craving for the depreciation of those whose apparent excellence offends our self-love. They threw dirt steadily and industriously at Pericles and his friends. Pericles was portrayed in a helmet; a helmet became him, and it is to be feared he knew as much. This led to much joy and mirth over the pleasant suggestion of a frightfully distorted bead, an onion head. The «goings on» of Aspasia were of course a fruitful vineyard for the inventions of the street. . . .
Dreaming souls, weary of the vulgarities of our time, have desired to be transferred to the sublime Age of Pericles. But, plumped down into that Athens, they would have found themselves in very much the atmosphere of the lower sort of contemporary music-hall, very much in the vein of our popular newspapers; the same hot blast of braying libel, foul imputation, greedy «patriotism», and general baseness would have blown upon them, the «modern note» would have pursued them. As the memories of Plataea and Salamis faded and the new buildings grew familiar, Pericles and the pride of Athens became more and more offensive to the homely humour of the crowd. He was never ostracized-his prestige with the quieter citizens saved him from that; but he was attacked with increasing boldness and steadfastness. He lived and died a poor man; he was perhaps the most honest of demagogues; but this did not save him from an abortive prosecution for peculation. Defeated in that, his enemies resorted to a more devious method; they began to lop away his friends. Religious intolerance and moral accusations are the natural weapons of the envious against the leaders of men. His friend Damon was ostracized. Phidias was attacked for impiety. On the shield of the great statue of the goddess Athene, Phidias had dared to put, among the combatants in a fight between Greeks and Amazons, portraits of Pericles and himself. Phidias died in prison. Anaxagoras, a stranger welcomed to Athens by Pericles-when there were plenty of honest fellows already there quite willing to satisfy any reasonable curiosities-was saying the strangest things about the sun and stars, and hinting not obscurely that there were no gods, but only one animating spirit (nous) in the world. The comedy writers suddenly found they had deep religious feelings that could be profoundly and even dangerously shocked, and Anaxagoras fled the threat of a prosecution. Then came the turn of Aspasia. Athens seemed bent upon deporting her, and Pericles was torn between the woman who was the soul of his life and the ungracious city he had saved defended, and made more beautiful and unforgettable than any other city in history. He stood up, to defend Aspasia, he was seized by a storm of very human emotion, and as he spoke he wept-a gleeful thing for the rabble. His tears saved Aspasia for a time. The Athenians were content to humiliate Pericles, but he had served them so long that they were indisposed to do without him. He had been their leader now for a third of a century. In 431 B.C. came the war with Sparta. Plutarch accuses Pericles of bringing it on, because he felt his popularity waned so fast that a war was needed to make him indispensable. «And as he himself was become obnoxious to the people upon Phidias’s account, and was afraid of being called in question for it, he urged on the war, which as yet was uncertain, and blew up that flame which till then was stifled and suppressed. By this means he hoped to obviate the accusations that threatened him, and to mitigate the rage of envy, because such was his dignity and power, that in all important affairs, and in every great danger, the republic could place its confidence in him alone». An expedition under the leadership of Pericles was unsuccessful, and Cleon seized the opportunity for a prosecution. Pericles was suspended from his command and fined. The story goes that his oldest son-this was not the son of Aspasia, but of a former wife-turned against him, and pursued him with vile and incredible accusations. This young man was carried off by the plague. Then the sister of Pericles died, and then his last legitimate son. When, after the fashion of the time, he put the funeral garlands on the boy he wept aloud. Presently he himself took the contagion and died (428 B.C.). The salient facts of this brief summary will serve to show how discordant Pericles was with much of the life of his city. This intellectual and artistic outbreak in Athens was no doubt favoured by the conditions of the time, but it was also due in part to the appearance of some very unusual men. It was not a general movement; it was the movement of a small group of people exceptionally placed and gifted. Ancient Greek Literature, by Gilbert Murray (Heinemann, 1911). For an account of his views, see Burnet’s Early Greek Philosophy. Gomperz’ Greek Thinkers is also a good book for this section.